The Mutineers Turning Lieut. 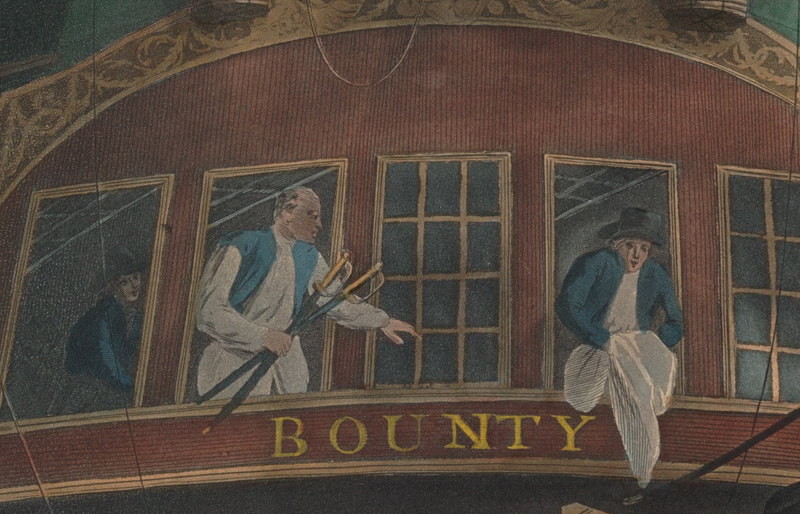 Bligh and Part of His Officers and Crew from His Majesty's Ship the Bounty, Robert Dodd, 1790, Brown University. 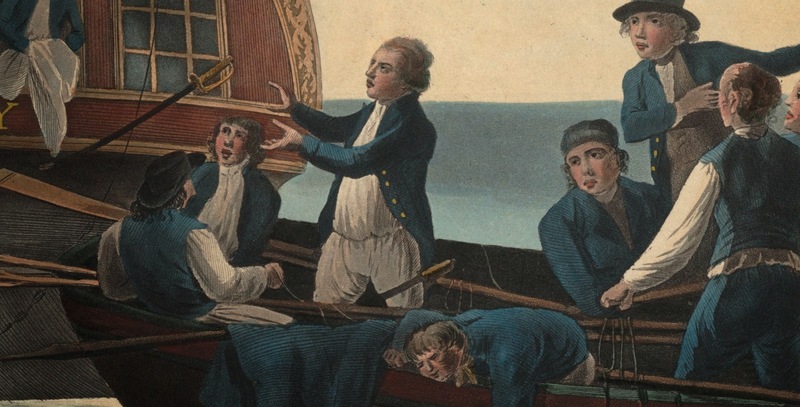 The 1789 mutiny on the Bounty is so well known it hardly requires introduction. Deep in the Pacific, Lieutenant Bligh is cast adrift by the mutineers who disappear to Pitcairn Island. Movies, novels, and all sorts of popular media have portrayed the event, but this is one the earliest pieces to represent the legendary event. 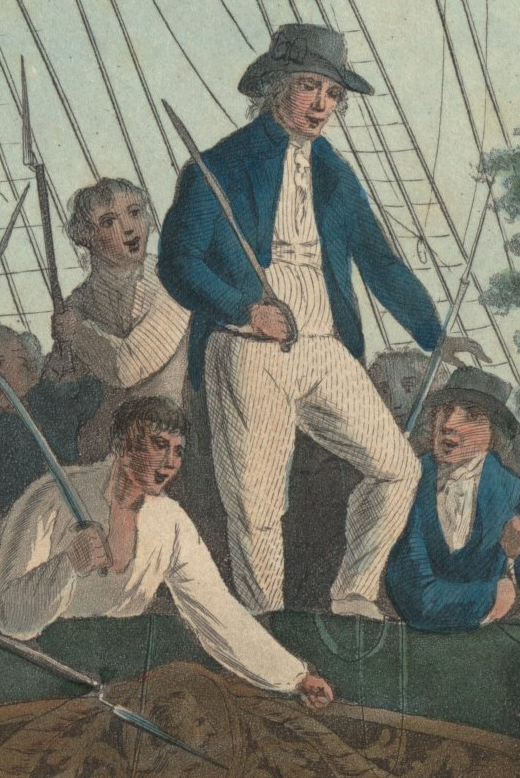 It is interesting in that the artist has chosen not to portray the moment of Bligh being roused by the mutineers, nor of the general confused conflict at the start of the mutiny. 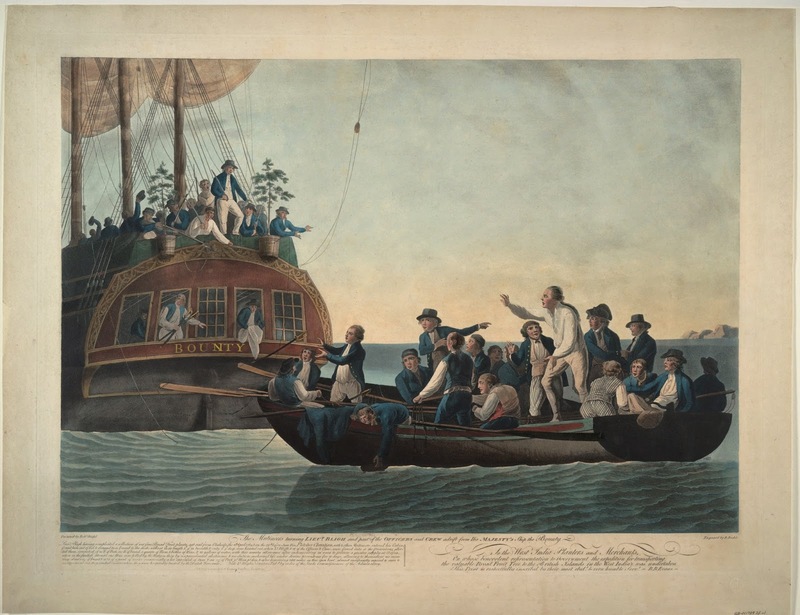 Instead, he has chosen to show Bligh at the beginning of his forty seven day open boat voyage of survival. Standing proudly on the stern rail of the Bounty is the first mate Fletcher Christian. Evans, the artist, has given him a self satisfied look. He wears a round hat with a tall crown and black cockade on the right. At first glance it appears that his trousers and waistcoat are striped, but the stripes appear to be more for texture and shading than to say something about the material. The shirtsleeves of the fellow behind him and the face of the tar to the right are both striped in the same manner. Also, the stripes do not fit with the pattern of a fabric, but rather with the way he stands. His blue short jacket bears a collar, and a nice cravat appears from his waistcoat. The sailors to either side of him likewise wear cravats. It could be argued that the jack to the right is wearing a neckcloth, but it is tied more in the fashion of a cravat than a working garment. Waving their round hats in triumph, sailors in blue jackets further forward celebrate the day. 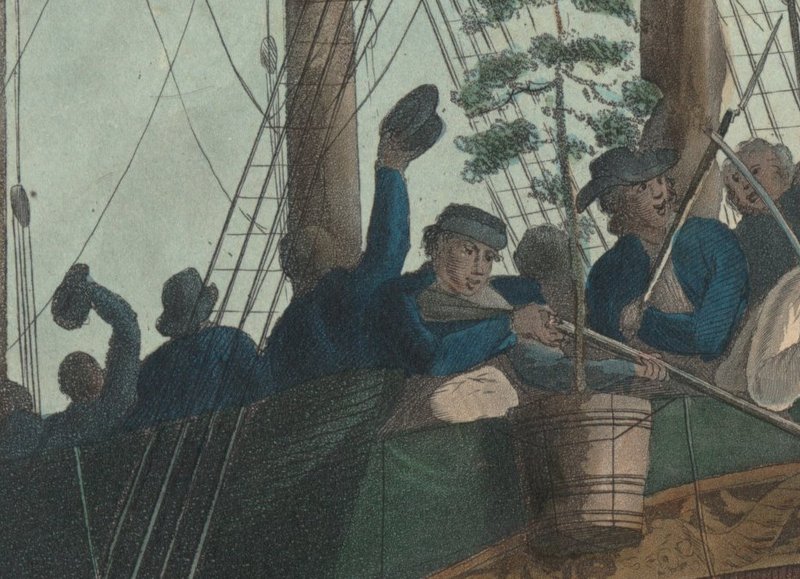 A more malicious set loiter at the stern rail with muskets and fixed bayonets. Just beside the breadfruit tree is a sailor with an odd cap, perhaps something akin to the jockey cap that sailors sometimes wore. The stern windows of the Great Cabin betray the chaos below decks. Sailors toss swords and goods out to Bligh and the loyal sailors with him before their arduous journey. 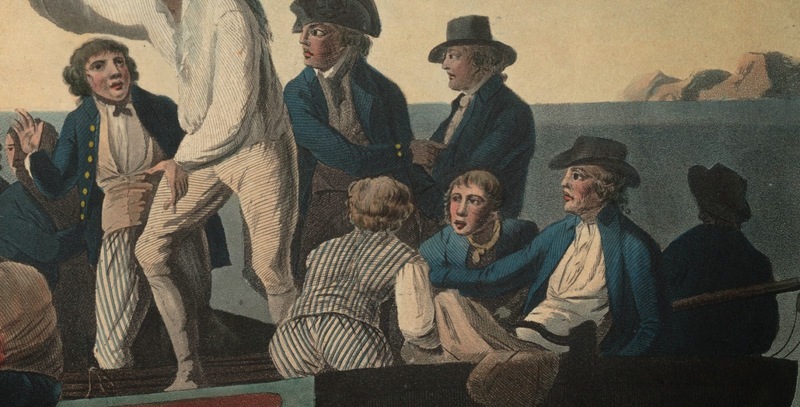 Two of the sailors wear shirts without waistcoats, blue short jackets, and black round hats. A third wears not hat at all, and appears to have his shirt untucked, or perhaps is wearing an apron. He wears an open blue waistcoat. Bligh reaches out to catch the sword being tossed from his own cabin. He wears no waistcoat, but a pair of loose breeches or trousers, and a blue officer's coat with brass buttons and lapels. The lack of a waistcoat or hat is telling. It is a nod by Evans to the hurried nature of Bligh's departure. Other sailors are without waistcoats and hats, to be sure, but he is an officer. At that, his eyes are cast upward toward Christian, who is in a complete set of clothes. A collection of officers and sailors are gathered at the stern of the open boat. Like their captain, their coats are distinguished by brass buttons, lapels, and collars. Two of them wear blue striped trousers, and one wears a waistcoat to match. 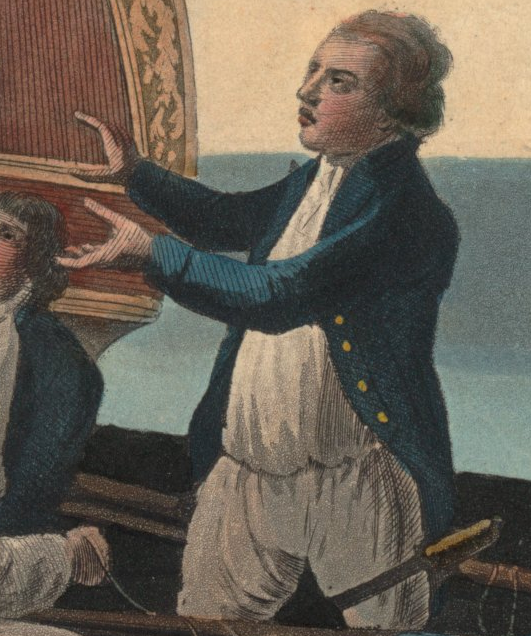 One of the sailors amidships wears a neckcloth of a natural color.